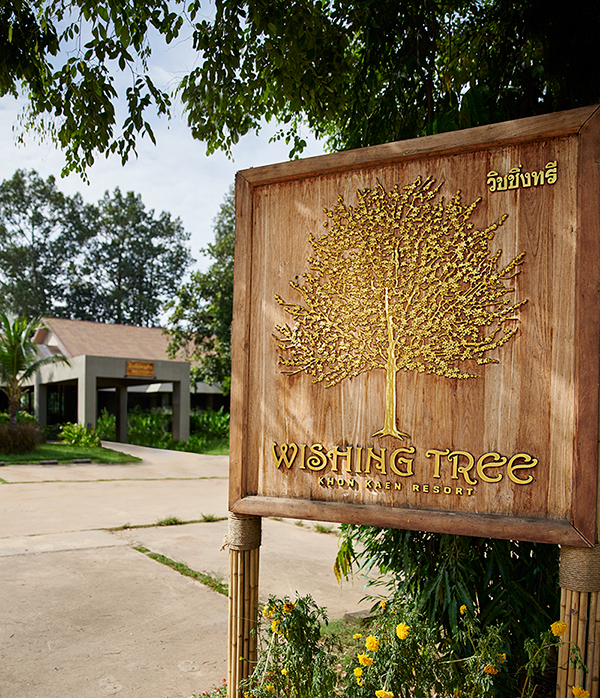 The Wishing Tree represents the provincial tree called the “Pink Shower Tree” (Cassia Bakeriana) which means providing prosperity and preventing decline. In keeping with the name, our resort is a destination of quiet beauty, a sanctuary of gentle waters and lush greenery in the heart of Isaan heritage and culture. Embracing the natural beauty of the surrounding land, water and sharing our dedication to help protect the environment for future generations. The rustical diversity of the Northeastern way of life, hospitality and self-sufficiency economy, underpin the exotic charm of inherited Isaan culture. Located just 10 KM from Khon Kaen city centre, the Wishing Tree Resort is nestled between rice paddies, gentle waters and lush greenery. With spectacular view of the Chi River, the rustical and diversity of north-eastern Thailand can be experienced while enjoying your stay at this serene and secluded resort. Embraces the natural beauty and rustical diversity of the Northeastern way of life Wishing Tree resort includes 47 remarkably spacious rooms and villas that draws inspiration from the traditional Isaan lifestyle, blended with contemporary details. From modern furnishings to local artefacts and colourful Isaan cottons, the decor embraces the natural beauty of the surrounding area and rustical diversity of the Northeastern way of life.